Pattern condition: Uncut, factory folded and complete with historic notes. View I - Gown with very low, rounded neck and tight sleeves ending in deep cuff over the hands; neckline, bodice front, cuffs and skirt decorated by guards. Front opening. C. 1500-1510. View II - Gown with front cut wide, with narrow bustband and plastron, hooked and laced down one side front; deep U back neck; long tight sleeves ending in deep cuffs over the hands. Skirt seams are off-center. Neckline can be decorated with guards or trim. C. 1505-1515. View III - Gown with low rounded neck; tight sleeves unevenly slashed in 6 places to puff over a faked chemise undersleeve; higher waist. Sleeve trim. Front opening. C. 1510-1520. 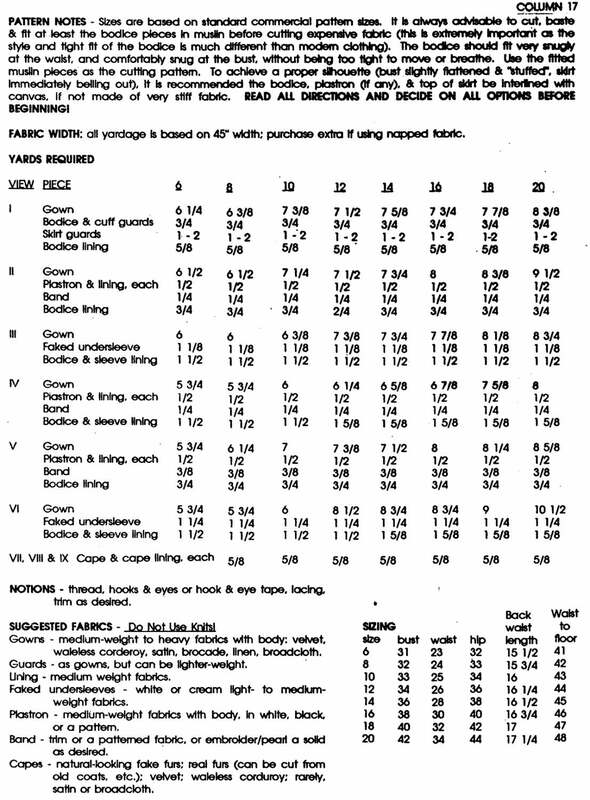 View IV - Gown with front cut wide, with low wide bustband and plastron hooked and laced down one side front; deep U back neck; upper and lower sleeves tied or laced along underarms and at elbow and shoulder, as desired. Skirt seams are off-center; neckline and sleeves can be decorated with guards or trim. 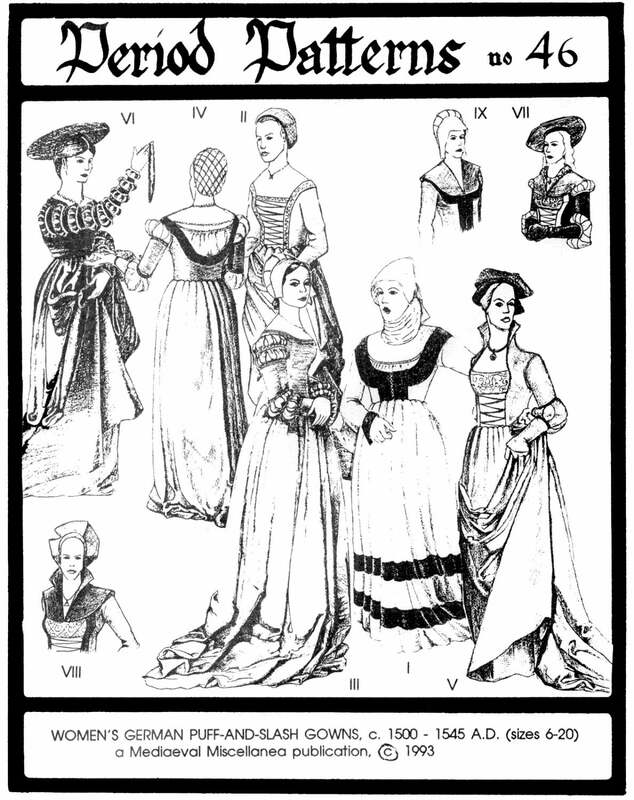 C. 1510-1545. View V - Gown with front cut wide and high Saxon collar, with low wide bustband and plastron hooked and laced down one side front; tight sleeves slashed or paned at the elbow to puff over the chemise, ending in short cuffs over the hands. Skirt seams are off-center; sleeves can be decorated with trim. C. 1520-1545. View VI - Front-opening gown with low square neck, with tight sleeves evenly slashed in 9 places to puff over the faked chemise undersleeves. Optional - sleeves decorated with trim. Front opening. C. 1530-1545. View VII - IX - Shoulder capes, C. 1510-1545.